Matthan Caan and Wietske van der Zwaag have won the Philips Brain Connectivity Award at the annual meeting of the International Society for Magnetic Resonance in Medicine (ISMRM) in Paris. ISMRM is an international, nonprofit, scientific association that promotes innovation, development, and application of magnetic resonance techniques in medicine and biology throughout the world, and welcomes 6000 participants yearly. Matthan and Wietske’s work on rapid and comprehensive quantitative imaging at 7T was chosen as the best Philips neuroscience contribution at the meeting. 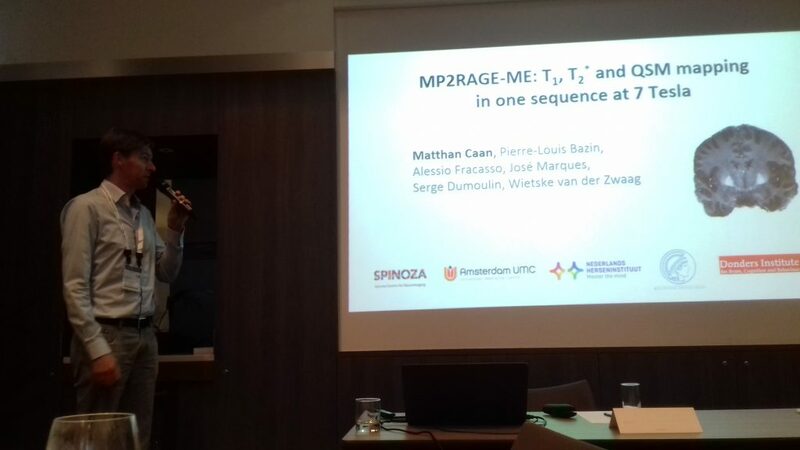 Their MP2RAGEME sequence acquires T1, T2* and Quantitative Susceptibility Maps, that are used for myelin and iron mapping in the brain. MP2RAGEME provides this information in a single acquisition providing a reduction of 35% in scan time without loss of quality while having a perfect co-registration. These qualities make the new sequence an ideal candidate for studying myelin and iron and their distribution throughout the brain. This sequence has a great potential for clinicians and neuroscientists, who have already started to use it for their studies at Spinoza.